We just can’t get enough of her. How much more sexual tension can they create between Tabrett Bethell and Bridget Reagan. The Seeker is one lucky fellow. Here are some more pictures for everyone to enjoy. 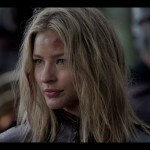 Let’s make this Tabrett Bethell fanbase grow!